How Far is Sanvi Spring Woods? 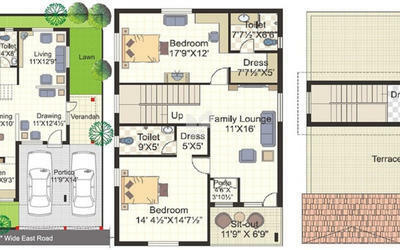 Sanvis Spring Woods, located in Hyderabad, is a residential development of ABC Group. 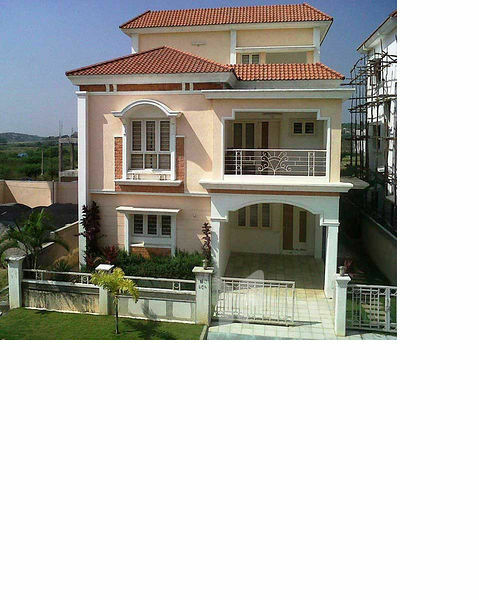 It offers spacious and skillfully designed 3BHK Villa. The project is well equipped with all the basic amenities to facilitate the needs of the residents. The site is in close proximity to various civic utilities. R.c.c.framed structre to WithStand Selsmic loads for ZONE-II. Brick masony with first class table molded light weight bricks in cement mortar. Internal: Double coat cement plaster smooth finishing. Celling: Double coat cement plaster smooth finishing. Main door: B.T. Wood door frame & shutter, aesthetically designed with pollshing and designer hardware of reputed make. Internal door: M.T. Wood frame & Solid core flush shutter with both Sides painted of reputed make and Standard hardware. Tollet: M.T. Wood frame & Solid Core Flush Shutter With both Sides Painted of reputed make and Standard hardware. Window frames & Shutters in M.T. Wood painted both sides with glass paneled glazed shutters & provision for mosquito mesh, fitted with elegantly designed M.S.grills With Standard hardware. Internal: Smooth finish With luppum or equivalent over a Coat of primer and top finish with two Coats of Plastic emulsion paint. Celling: Smooth finish with luppum or equivalent over a Coat of primer and top finish with two Coats of Plastic emulsion paint. External: Premium exterior texture Weather-Proof pant. Toilets/Utility area: Anti Skid Ceramic tiles. Covered Terrace & Balconies: Ceramic tiles. Kitchen Platform: Glazed ceramic tile dado up to 2'0' height, above kitchen platform. Toilets: Designer Make glazed ceramic tille dado upto 7 '0' height. Utility/Wash: Glazzed Ceramic tille dado up to 3'0' height. Granite platform with Stainless Steel Sink & provision for fixing Aquaguard. Provision for exhaust fan and chimney.Upgradable to designer modular kitchen at extra cost. Water supply points in kitchen/ toilets as required. Cascade EWC with health faucet in master bedroom. All C.P. fittings are of Jaquar or equlvalent make. Concealed copper wiring in condults for lights, fan, plug and power plug points wherever necessary of finolex/Anchor or equlvalent make. power outlets for gerysers in all bathrooms. Plug points for refrigerator, Tv & audio systems etc,Wherever necessary. 20Amps 3-phase supply for each unit and individual meter boards. Miniature Circuit Breakers(MCB) & ELCB for each distribution board. All electrical fittings of Anchor/ ELLEYS or equlvalent make. Solar Water heating system to be provided to individual units at extra cost. elephone points & TV Points in master bed rooms and drawing areas. Intercom facillity in all units connecting to security. internet provision in master bedroom and study room.